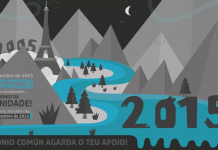 The Inscription of Shared Cultural Heritage | Ponte... nas Ondas! In 2001 the Association PONTE…NAS ONDAS! 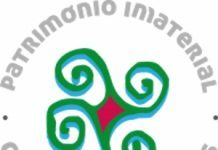 began to promote the presentation of the Candidacy of Galician-Portuguese Intangible Cultural Heritage to UNESCO, an initiative with the aim of international recognition of this cultural heritage. 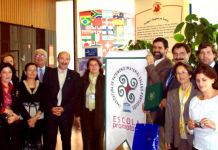 On 25 October 2004, a group of professors from the PONTE…NAS ONDAS Association submitted the Candidacy for Galician-Portuguese Intangible Cultural Heritage, at the headquarters for UNESCO in Paris. Born from schools on both sides of the Miño River, this Candidacy brought together a great unity in Galicia and Portugal (as well as in the Galician-Portuguese diaspora) and earned the support from the Spanish and Portuguese governments as well as that of the Xunta of Galicia, with numerous institutions collaborating on the execution of the preparatory jobs (universities, museums, associations…). On 25 November 2005, Galician-Portuguese Intangible Cultural Heritage opted to be proclaimed as a Masterpiece of Human Cultural Heritage. On that day, UNESCO recommended presenting the proposal again, highlighting its great value and the richness of its manifestations and expressions. Ample support on the part of important personalities of the world of culture, education and science was solicited through collective and individual bonds (José Saramago, Nélida Piñón, Federico Mayor Zaragoza, Suso de Toro, Manuel Rivas, Mário Claudio, etc.). Under the principles of UNESCO’s Convention for the Preservation of Intangible Cultural Heritage, the new model established by UNESCO and PONTE…NAS ONDAS! continues the work of identification, study, investigation, transmission, spread and valuing of shared Galician-Portuguese Intangible Cultural Heritage, an initiative in which schools are the real movers and shakers.